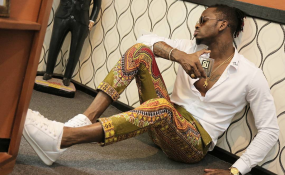 Watch Why Diamond Platnumz Shouldn't Jump While on Stage! Tanzanian music regulatory board Basata has threatened to sue musician Diamond Platnumz with a criminal offense if he performs at his Wasafi Festival set for Nairobi on New Year eve. The threat comes after Basata had slapped an indefinite ban on Diamond and his Wasafi Records colleague Rayvanny from performing in or outside Tanzania after they disregarded its ban on their 'dirty' song 'Mwanza' . Diamond is scheduled to have three shows in Kenya on New Year's Eve in Embu, Mombasa and Nairobi. According to one of his manager Babu Tale, despite the ban by Basata, all the Kenyan shows will proceed as planned. "The concerts will go on as planned. To be Specific all of them," Babu Tale was quoted. But in a quick rejoinder, Basata acting chief executive Onesmo Kayanda has stated such a move will amount to treason. "Sisi Basata we are the substitute of the government. Kama akiamua hivyo (perform in Kenya), hii kanuni ya Basata huwa inakuwa ni substitute ya sheria za nchi na akiikaidi lile suala linakuwa la kijinai. "Likishakuwa la kijinai linakwendwa kwa Mwanasheria Mkuu wa serikali sisi tunawakabidhi mahakamani. Kwa hiyo mtu akikuika kanuni zetu za Basata, amevuka na kwenda kwenye ishu ya kijinai" Kayanda noted. Kayanda also pointed out that Diamond is yet to pay the KSh400,000 (Tsh9 milion) fine imposed on him following the ban of 'Mwanza' song which he collaborated with Rayvanny. He also dared Diamond to make good his threats to relocate from Tanzania if he feels Basata regulations are too much to handle.